So many of us want to travel. We dream of it while we are at work, going weak in the knees as we scroll through images of dream vacations in tropical paradise, clutching our warm mug in the dead of a northern winter. We fight reality while denying ourselves the dreams that linger deep within our hearts. Or at least that is what I used to do. Then, I decided to start living my dreams. One amazing thing I discovered while on my journey to dream-realization was about creating vision boards. When I started indulging in vision board creation, I not only learned about the power of images, but I also started to view imagination in a whole new light. I realized that in my focusing on what I wanted, I had the choice to either allow myself to sink into a feeling of lack, concentrating on what I did not yet have, or I could embody the emotions I would feel if I had what I wanted and really indulge in my fantasy. I chose the latter and I decided to consciously start indulging in my dreams on a daily basis. vision board somewhere close by so that you will see it regularly, thus activating those awesome emotions those images bring to us. There are so many ways to go about creating a vision board. There is the old school way of gathering magazines and sitting around sifting and clipping. And there is the new age way of going digital and harnessing the power of the net. I prefer going digital because it doesn’t take up the physical space in my life and because I can usually find the exact image I know will bring me ultimate inspiration (and in much less time at that). As far as the subject matter of a vision board goes, this too can vary greatly. It may feel good to just do a general board, hitting on various areas of our lives, or we may want to hone in on a topic, like our physical health, our living space, or our professional life. For the sake of this piece, let’s hone in on creating a digital vision board that specifically pertains to travel. We want to travel. Nearly all of us want it so badly that if someone asks us where we want to go we already have a place in mind. Some of us have lists. Some of us have lifetimes of it planned. How about we make that a reality? There’s no wrong way to create a vision board, but the timing is important. It’s important to be in the right frame of mind when going into vision board mode. Perhaps you will find yourself inspired and ready to go. Or you may need to do some work to get there. Take a few minutes to clear your mind, to breathe and just be. Do some light stretching or movements to get connected to your body. Do whatever you need to feel comfortable in all parts of you. Now that you have set your internal environment for the creative time ahead, allow your mind to fantasize about your travel dreams. What do those dreams feel like in your body? Do you feel good imagining them? Make sure you are feeling excited and abundant about them before moving forward. Then, try asking yourself some questions and see what comes up. What places excite you when you think about visiting them? What sights do you want to see and experience? What cultures do you want to learn about? What foods do you want to try? What music do you want to hear? What smells do you want to breathe in? What activities do you want to try? How do you see yourself moving from place to place? Where do you envision resting your bones after a day of exploration? Ultimately we are looking to gain a sense of the feelings you want to experience and the images that come to mind when you feel those emotions. As far as project duration goes, don’t worry about having enough time to complete your vision board all at once. Some boards get created in an afternoon and some take shape over a longer period of time. Yours will come together in a unique way for you. Just set out when it feels right and leave the rest to unfold naturally. Now that you have fully set the stage, it’s time to find those images. Start by creating a “Vision Board” folder on your computer (or a safe space to store images on your phone or tablet). This is where you will save your images as you come across them. Now seek out those inspiring pictures. Perhaps you already have some in mind, maybe from a friend’s recent trip or from something that caught your eye on social media. If that’s the case, grab those ones out first and save them (no worries about copyright infringement because this is for your own personal viewing). Most images you are going to have to search for. This is the fun part, which I really favor using Google Images for (although I encourage you to use any image finder you enjoy). Using the first image you have in mind, search a word or phrase that you think will generate the results you are looking for. This sounds fairly straightforward, but sometimes it can be tricky. Remember there are a lot of images out there. For example, you may get really excited by the thought of backpacking through Europe. However, upon a Google image search of “backpack Europe” you may find that the results are not what you had in mind. I suggest honing in on what you are really envisioning. Is it a Villa in Italy? Or perhaps a small café in France? Is it the coast of the Mediterranean? Or night life in Madrid? Whatever it is, get more specific. Perhaps your phrase is something as precise as “moonlight on water in Greece” or “mangoes market Spain”. The clearer you can be, the more success you will have in finding the results you are looking for. You may also decide you want certain inspiring words on your board. If this is the case you can either search for them or create them in a program such as Microsoft Word’s WordArt, then save them as an image file. Once you feel like you have enough images, it is time to start putting them all together. There is no right or wrong way to do it. 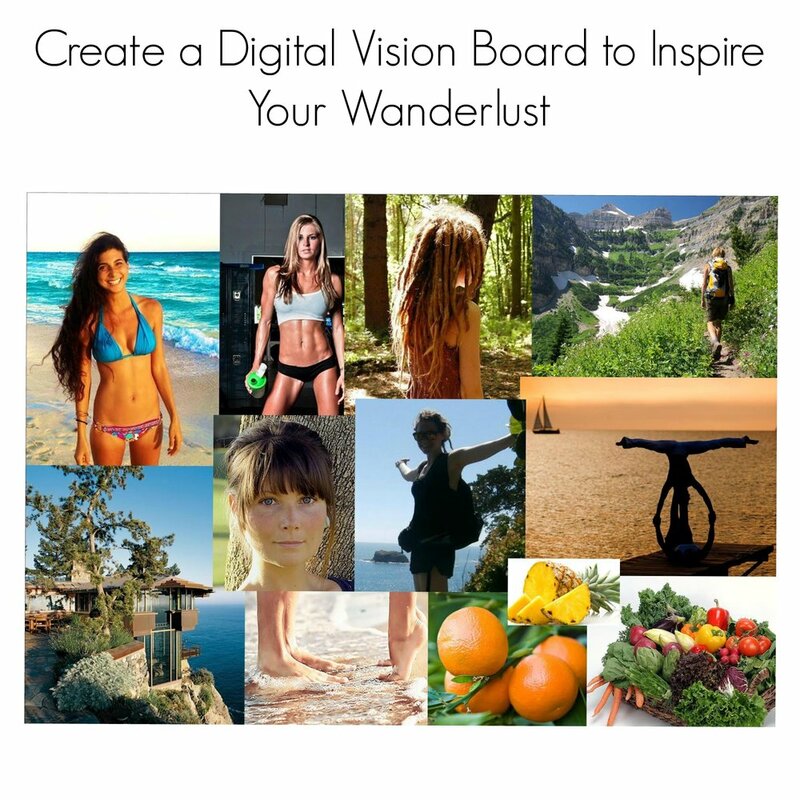 There are a number of programs you can use to put together your digital vision board. Basically, choose anything that is easy to paste images into while still being able to crop and resize them. Some common programs that would work are Photoshop, Publisher, Gimp, Word, Pages and although I have never used any, I believe there is even software you can use that is specifically for vision board creation. Once you have selected your preferred program, enjoy pulling in the images you found that feel good for you. Play around with where you want them positioned on the page, what images you want side by side, what size you want them, and so on. and so you just have a few pictures. Or perhaps you prefer the excited energy of having everything together. Whatever you decide, it is your creation. Check in with yourself throughout the process of creating your vision board. Make sure you are feeling excited and playful. If it starts to feel like work at any point, just stop and continue the next time you feel inspired. Once you have completed your board, sit back and marvel at your finished product. Then, post it somewhere you will look at it regularly. Perhaps it will become your desktop background, or the lock screen on your phone. Maybe you print it out and hang it on your fridge or in your office. Take pleasure in the viewing of your vision board as frequently as you would like. Let the emotions fill you and remember that you can have everything you dream of. As you grow and shift, so will your fantasies. If it is fun for you, keep creating vision boards along your journey, saving them, so you can look back over time and take note of all the beautiful ways your dreams have unfolded before you.